I may be the luckiest person in the world. Through my adventures with Sustainable Kentucky, I get to meet some of the state’s most interesting people and make amazing friends who are working hard every day for the good of their communities and the environment. For a long time, I’ve thought about how exactly I could share all of this awesomeness with you in a way that was a little more direct then just some words and pictures. This spring, I’m going to do just that. 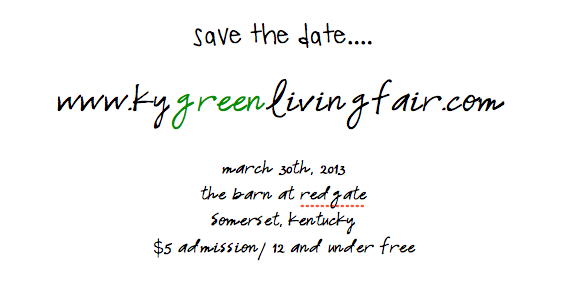 On March 30th, Sustainable Kentucky will be presenting the Kentucky Green Living Fair. There are so many great details coming together that I can’t announce yet. Oh, how I want to…. But good things come to those that wait. Local food, amazing vendors, live demos and music, and a chance to meet some of Kentucky’s best, brightest, and greenest people (but I may be biased). You won’t want to miss this one! Plan to join us in Somerset at the Barn at Redgate on March 30th and I promise you won’t be disappointed. Mark your calendars (maybe with sprinkles or glitter?) and keep checking back for more info here and directly at www.kygreenlivingfair.com. Can’t wait to see you! Think you’ll be able to make it? RSVP on our Facebook event page! Sponsor and vendor inquiries to info@sustainablekentucky.com.